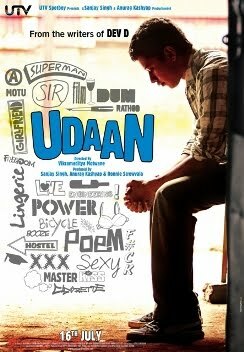 Here is a quick review on a movie I saw last night and thoroughly enjoyed too - UDAAN. I went in thinking this would be a typical parallel-feel-good-cinema kind of a movie and would either end with darkness or lots of light. But the movie is unusual in treatment. No use giving a typical review of the movie, you can read it here, here and here. Let me talk here about the grayness of the movie here. The movie has only about 3 characters and the whole story revolves around them - Rohit, his father and his six year old younger half-brother. The one character which stands out is the father, full of darkness, but with glimpses of light and some rare love as well. Easy to hate, but impossible to dismiss. Lots remain unsaid about why and how he is the way he is, but there are enough glimpses throughout which act as clues. In fact there is lots that's left unsaid and that makes the movie even more delightful. The intelligence of the movie lies in treating its audience as intelligent, and as audience you do feel good about it. The end is surprisingly resolved, though still open ended. One can easily take the movie forward after leaving the theater. Despite the duration, I strongly recommend the movie to all movie lovers. This one surely remains with you even after you are out of the theater. And if it doesn't, consider yourself unfortunate. p.s. I never saw the promos, but here is one for those who still thinking about watching it. ur post as 7 'here's and they are all scatterred on the web! so that i can watch it on my laptop sometime next or next to next year! Like 'Rock on' which I watched day before yesterday! I love coming of age stories. This is one of my favourite movies- awesome soundtrack too!